Macy’s department store in downtown Seattle occupies a prominent corner in the city’s bustling landscape. This iconic and historic building has undergone dramatic changes in the past few years as the retail footprint has shrunk and Amazon has taken up residence in the top six floors in the eight-story building. The transformation has required a host of upgrades, including a substantially larger generator that our power generation team was tasked with providing. Surveying the building and assessing its needs was the easy part. Answer: An MTU 10V1600 DS500, capable of providing 500 kw of power. The difficult part was getting the unit and related components three floors underground into a tight space that was significantly altered to adhere to more stringent building codes. The only way the new generator was going to get to its new home was in pieces. “I’ve been doing this for 24 years and have seen maybe three or four projects that were this complicated,” said Mike Atchley, our project manager who oversaw the mission. The impetus for the piecemeal approach to installing the genset was structural improvements to the building’s foundation and basement. 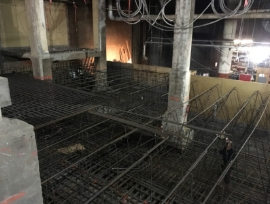 Thousands of pounds of rebar were added and then covered with enough concrete to fill 100 trucks, which came at a rate of 10 per hour. This newly reinforced floor is where the MTU generator was installed. But the freight elevator that was used to lower the genset has a weight limit of 6,000 pounds. The generator’s size and weight meant the PPG team had to find a way to make the unit smaller. The solution was to disassemble the generator. Technicians spent three days breaking the generator down to the engine, skid, alternator and tanks. Another couple of days were spent lowering each component separately and moving it about 100 feet. Finally, the techs spent several more days reassembling the generator. The underground location also required the team of technicians to install a remote radiator and cooling system that is a floor above the generator. Once those connections were finalized, it took several days of testing to confirm the new system was operable. 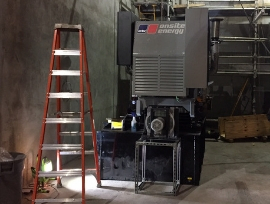 Dmitry Kraskovsky, a member of our power generation sales team, said the entire project took a tremendous of time and detailed planning to not only get the generator into position, but to get it tested and running quickly. 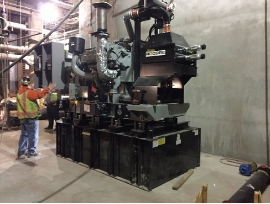 Since the 500 kw generator was installed, Amazon’s continued expansion into the building has required the installation of a second generator. Dmitry said the power generation team added an MTU 350 kw unit to the building. That project, however, was a much simpler and quicker installation.